USS Harry S. Truman, currently slated for the chopping block. Is the Truman’s early retirement the sign of things to come? Last week, the Pentagon was abuzz with the news that the U.S. Navy had offered up a sacred cow: the early retirement of an aircraft carrier as a way to save money. The loss of the USS Truman would cut America’s carrier fleet down to 10 flat-tops, violate federal law, and stir howls of protest from Congress. Does this mean the carrier is no longer at the top of the heap, naval power-wise? Is the concept of the aircraft carrier itself as a viable weapon system headed for the chopping block? In March 2017, President Donald Trump promised to grow America’s aircraft carrier fleet to 12 carriers as part of a naval buildup to 355 ships. 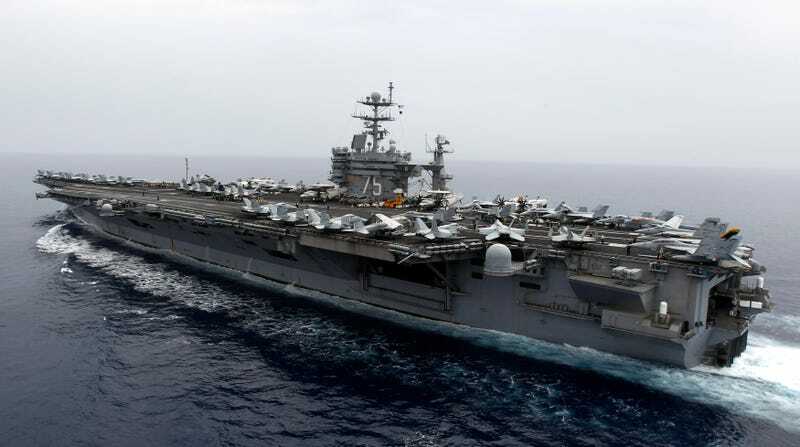 Now, just two years later, Trump’s defense budget calls for the aircraft carrier fleet to fall to 10 ships by decommissioning the Nimitz-class carrier USS Harry S. Truman early. The carrier, slated to go into the shipyards for a nuclear reactor refueling and general overhaul in 2024 would instead be retired, saving $5.5 billion. The United States Navy has operated aircraft carriers for a hundred years. Proponents describe carriers glowingly as “4.5 acres of sovereign American territory” that, propelled by nuclear propulsion, can cross entire oceans without refueling, delivering four squadrons of strike fighters wherever they are needed. Critics pan them as big targets stuffed to the gills with thousands of personnel, overpriced and not cost-effective. Indeed, it makes sense their relevance has been questioned. The carrier ascended to the top of the naval world in World War II, replacing the battleship as the dominant naval platform of the age. Yet today carriers are as popular as ever with the major powers of the world: the United Kingdom has two new carriers, China has two carriers with two more on the way, Japan is converting existing ships into carriers, and Russia is desperately trying to keep its only aging carrier afloat. HMS Queen Elizabeth entering New York harbor, October 2018. A lot rides on carriers. They are an elevated, almost over-the-top symbol of national prestige, and losing one would stun the nation. The latest, USS Gerald R. Ford, will have a crew of 5,500, meaning her loss would represent the worst single day for the U.S. military since Pearl Harbor. They cost billions, money that could have gone to submarines or other platforms. Meanwhile, carriers face a more complex array of threats than ever before. There are traditional threats, including ship-killing missiles, submarine torpedoes, mines, and nuclear weapons. The rise of China and Russia’s seeming resurgence have introduced two new weapons, the anti-ship ballistic missile—basically a ballistic missile capable of steering itself to an aircraft carrier-sized target—and hypersonic missiles traveling at speeds in excess of Mach 5. Essex-class aircraft carrier USS Intrepid, July 1945. Carriers, and their planes, have also grown extremely expensive. During World War II, an Essex-class carrier cost approximately $1.1 billion in today’s dollars, while a Hellcat fighter cost the equivalent of $734,000. Today, a Ford-class carrier costs about $11 billion and a F-35C Joint Strike Fighter costs $107 million. The cost of both carriers and their aircraft is staggering—some would say unsustainable. So is the carrier dying? In many ways, yes. Can it be saved? The answer relies in the carrier’s relationship to the aircraft it carries. As long as aircraft are viable weapon systems, so are carriers. The tendency is to think of carriers as the weapon system, perpetually on the brink of obsolescence, prepared to join the trireme, man o’ war, and battleships in the hall of naval has-beens. Yet carriers are basically the same as they were hundred years ago: a large ship with a full-length flight deck designed to launch and recover aircraft. The carrier has stayed relevant by regularly updating its aircraft, a uniquely modular approach to firepower and technology. Many of the U.S. Navy’s carriers once embarked aircraft that first went to sea in the 1970s, thoroughly obsolete by modern standards, but will eventually host the F-35C and other 21st century aircraft as they roll off assembly lines. An X-47B Unmanned Combat Air System demonstrator launches from the flight deck of the aircraft carrier USS George H.W. Bush (CVN 77), 2013. The march toward unmanned aircraft is the key to keeping the ship-aircraft duo relevant for the years to come. Unmanned aircraft are smaller, cheaper, and have longer ranges than manned aircraft, thanks to eliminating the human that locally controls it. This frees up room to add greater range, make the aircraft physically smaller, or both. Unmanned aircraft that have the range to destroy anti-ship ballistic missiles and hypersonic weapons before they can destroy the carrier will keep the ship safe while winning the war. Making carrier-based aircraft unmanned ends the march toward excessive cost overruns that make today’s fighter more than 100 times more expensive than its predecessor. It will give the carrier aircraft more capable of flying more missions, increasing the ship’s overall firepower. And reducing the number of pilots and support crew will allow the carrier to operate with fewer personnel. The U.S. Navy—currently the only naval force experimenting with carrier drones—flew its first drone off a carrier in 2013, leading to a decision to procure eight carrier-based MQ-25 Stingray tankers by 2024. In the past two weeks Boeing Australia unveiled its Loyal Wingman technology demonstrator and Kratos Defense flew the XQ-58A Valkyrie drone. Although built for the Air Force, the technology could easily be ported to carrier-based ships. The XQ-58A in particular has a spectacular 3,000 mile range—enough for it to destroy anti-ship missile batteries on the ground before they can threaten carriers or fly fighter cover a thousand miles from its home ship. Last month, the Center for Strategic and Budgetary Assessments released a study, “Regaining the High Ground at Sea”, advocating a new carrier air wing where more than half of the aircraft are unmanned. “Today’s carrier aircraft,” CSBA warns, “lack the range, endurance, survivability, and specialization to carry out the operational concepts needed to defeat great power militaries.” The CSBA’s proposed air wing has just 20 manned aircraft, with a further 24 unmanned strike and electronic warfare aircraft. A certain number of manned aircraft will likely remain on the ship, but entire categories of carrier-based aircraft, including bombers, tankers, intelligence, surveillance, and reconnaissance aircraft could go unmanned. The carrier doesn’t need saving. If a weapon system is no longer effective, it needs to be retired. Yet in some ways the carrier is just the platform for the real weapon, the airplane, bringing them wherever the country needs them to be. As long as the airplane is relevant in the fast-paced world of modern warfare, we’re going to need something to schlepp them at sea.